These days it’s difficult to remember what values the American people share. That’s because the U.S. government does so many things that seem to contradict basic human values. Wars of aggression, torture, kidnapping and indefinite detention, warrantless wiretapping, and so many other oppressions have become standard operational procedure for the U.S. government. Those who recognize and seek to correct this system of abuse soon realize that the key to doing so is to reveal the truth behind the primary driver for all of them—the crimes of 9/11. It’s important to know what makes someone an American and what does not. Here are some examples of what does not make someone an American. Welcome to The Corbett Report Subscriber, the weekly newsletter for members of this website. My editorial is always available for free at TheInternationalForecaster.com, but this week’s subject is of such importance that I am opening this post up for everyone. If this information is of value to you, please help spread it to others.This work is made possible by the subscribers of this website. For as little as $1 per month you can help to keep this work coming. If you haven’t yet, please sign up for a Corbett Report membership by clicking here. (1) Japanese troops set off a small explosion on a train track in 1931, and falsely blamed it on China in order to justify an invasion of Manchuria. This is known as the “Mukden Incident” or the “Manchurian Incident”. The Tokyo International Military Tribunal found: “Several of the participators in the plan, including Hashimoto [a high-ranking Japanese army officer], have on various occasions admitted their part in the plot and have stated that the object of the ‘Incident’ was to afford an excuse for the occupation of Manchuria by the Kwantung Army ….” And see this, this and this. We have used a combination of manual and automated analysis, including analysis of content, timing, technical indicators, and other reporting, in order to initially identify (“red-flag”) the following as Russian propaganda outlets. We then confirmed our initial assessment by applying whatever criteria we did not originally employ during the red-flag process, and we reevaluate our findings as needed. Please note that our criteria are behavioral. That means the characteristics of the propaganda outlets we identify are motivation-agnostic. For purposes of this definition it does not matter whether the sites listed here are being knowingly directed and paid by Russian intelligence officers, or whether they even knew they were echoing Russian propaganda at any particular point: If they meet these criteria, they are at the very least acting as bona-fide "useful idiots" of the Russian intelligence services, and are worthy of further scrutiny. Richard Gage, AIA, architect and founder of Architects & Engineers for 9/11 Truth, was among those interviewed by Russia One TV at the "Justice In Focus" conference on September 10 and 11, 2016, at the historic Great Hall of New York City's Cooper Union. Visit http://911justicefocus.org for more information about the landmark two-day conference, which focus on strategies for finally bringing justice for the events of September 11, 2001. This 17-minute television news report by Russia One TV reached an audience of 150 million on the 15th anniversary of 9/11, perhaps the largest audience that has been exposed to 9/11 Truth in one single shot. In this week’s episode of The Geopolitical Report with Kurt Nimmo, we examine a recent revelation by the Bureau of Investigative Journalism on a Pentagon psychological operation in Iraq following the 2003 invasion by the United States. From there we look at how the CIA spawned its Operation Mockingbird and the ongoing effort by the national security state to control media and form consensus for its foreign policy objectives. We all know by now that the real terrorists (the politicians in the suits and ties and the banksters that pull their strings) are waging their war of terror on multiple fronts for multiple reasons. Domestically, it rallies the population around the flag, keeping the flock in check. At the same time it justifies the build up of the police state control grid to catch the thought criminals who resist. What kind of an American are you? Will you mourn the dead or will you celebrate the government as protector of national security? For thoughtful and historically balanced realists the correct reaction is that the last remnants of the Republic collapsed with the twin towers and burned with the response from the Pentagon fire. 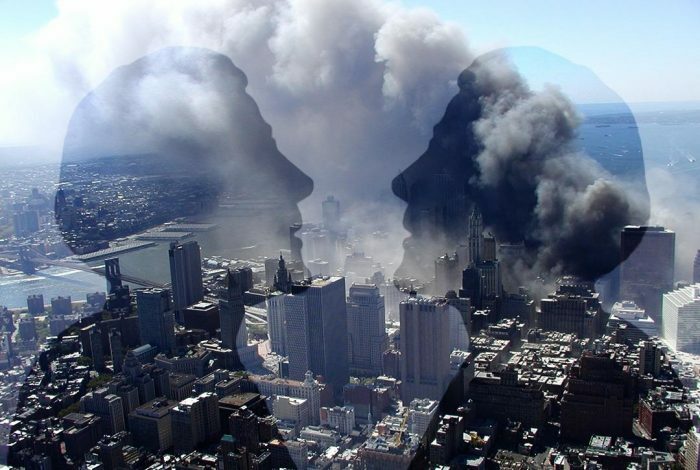 Most docile and obedient subjects of the despotic regime that has morphed into outright tyranny still believe the official report from The National Commission on Terrorist Attacks Upon the United States, provides the definitive details on the 911 investigation. (1) In 1697, native American conspirators admitted in court that Iroquois leaders convinced a Piscataway tribesman to murder an Englishwoman in Virginia for the purpose of igniting a war between the English and the Piscataway – thus weakening both parties – and allowing the Iroquois to seize Piscataway lands. It’s been 15 years since the 2001 terror attacks on New York’s twin towers changed America forever. Thousands lost their lives or loved ones in the calamity and many others subsequently lost their health. However, everyone in the US lost something else on that tragic day: peace of mind. RT Doc asks how 9/11 transformed modern America’s world view. In this week's episode of 9/11 Free Fall, AE911Truth founder and CEO Richard Gage joins host Andy Steele to discuss Justice in Focus—a weekend symposium being held at historic Cooper Union in New York City on September 10th and 11th. As one of the event's sponsors, AE911Truth is looking to draw hundreds of researchers and activists to this commemoration of the 15th Anniversary of 9/11. Symposium speakers and panelists will be presenting the results of their efforts to expose the true account of the World Trade Center attacks and to obtain justice for the victims and their families. An appeal from the man accused of plotting to blow up a Christmas tree in downtown Portland, Oregon accuses the FBI of entrapping the man on charges of terrorism. On Wednesday the Ninth Circuit Court of Appeals heard arguments related to surveillance and possible entrapment of Mohamed Mohamud, the man convicted of attempting to blow up a Christmas tree-lighting ceremony in Portland, Oregon in 2010. 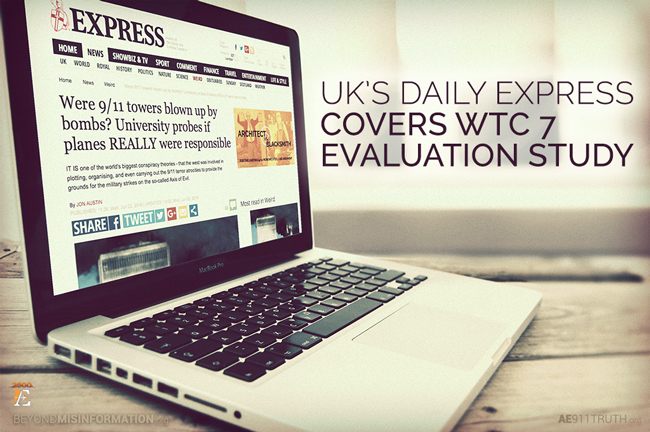 Yesterday morning we woke up to the great news that one of Britain’s largest newspapers had just published a story on WTC 7 Evaluation. This computer modeling study of World Trade Center Building 7’s collapse is being conducted by engineers at the University of Alaska Fairbanks (UAF) and is being sponsored by Architects & Engineers for 9/11 Truth (AE911Truth). You can check out the article here. The Daily Express receives an average of 1.3 million visitors each day and has a daily print circulation of 400,000. Although the article starts off with the customary kneejerk sensationalism, it quickly turns to neutrally reporting on the unbiased research being done by UAF’s Dr. Leroy Hulsey into how and why WTC 7 fell.